The Julie Crown Trio featuring Dave Leadbetter on keyboards - 1999. 'Forget about a career, performance is a lifestyle' - Pieter Dirk Uys, Darling. The Julie Crown Ensemble consists of highly competent local jazz musicians configured specifically with the event and client's needs in mind. 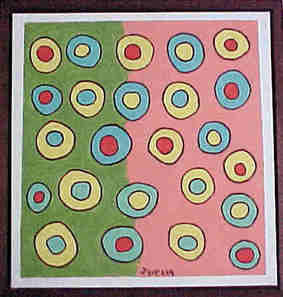 A core group of musicians exists and it is scaled up or down depending on the brief. The jazz ensemble is extremely versatile with a broad repertoire covering 50's standards and material right through to contemporary styles such as Acid Jazz. Ranging in size from solo performances right through to an 8 or even 10 piece band, we are able to suit the requirements of any occasion. No ensemble is ever the same though certain key players, such as Alvin Dyers (guitar), Basil Moses (bass) and Ezra Ngcukana (sax) are often included in the lineup, forming the core group. Vocalists may be added where needed. Julie Crown at the Evita's se Perron Talent Contest, Darling - 2000. The Julie Crown Ensemble with mystery guest vocalist - 1999. 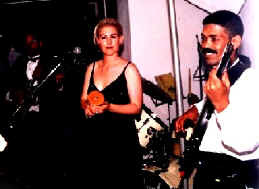 Julie Crown with Dermot Reeve(OBE) & Alvin Dyers on guitar at The British High Commissioner's New Year's Eve Party - 1996. 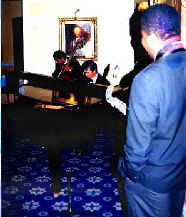 Musicians take a break at the Lanzerac - 1999. 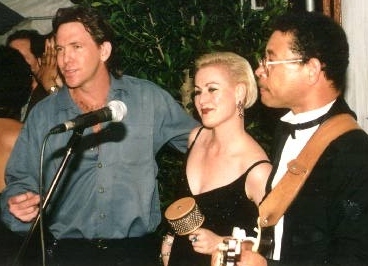 The Julie Crown Ensemble at the British High Commissioner's Residence - 1996. '90% of genius is just showing up' - Woody Allen, The Sunday Independant, May 2000.